You'll be £19.99 closer to your next £10.00 credit when you purchase The US Eighth Air Force in Europe. What's this? Order within the next 6 hours, 23 minutes to get your order processed the next working day! Using narrative accounts and new insights this book catalogues the dramatic and first-hand oral testimonies of the US Army Air Corps' bomber crews of the newly created Eighth Air Force that became stationed in East Anglia in 1942. It begins with shock of the unannounced Japanese attack on Pearl Harbor and how it affected the young men who were destined to fly and fight in Europe. American troops, or GIs as they were known because of their own derisive term of 'General Issue', began arriving in war-weary Britain in the months immediately after Pearl Harbor. Bomber and fighter groups made an especial impact. The young Americans with their well-cut uniforms, new accents and money, created a colourful heroic chapter in the lives of the British people that is still remembered today. The Americans and the villagers and townsfolk of East Anglia shared a close attachment that only wartime can create. England between 1942-45 was a battle front. The civilians were all involved in the war effort - as shipyard and factory workers, Red Cross and Land Army, farmers and firemen. Above all they were stubborn, determined fighters who had already endured more than three years of war. Into these lives came the sights and sounds - particularly the jargon - of the Americans, unprepared for the difficulties of flying in Britain's and Northern Europe's unpredictable and difficult weather. It is the story of the American's first encounters with the Luftwaffe, heavy Nazi air defences and the wartime strictures that Britain had already endured for three years. These are their memories. Martin W Bowman, an expert on the subject, has compiled an alternative perspective on the Eighth through this new book, which takes a personal look at the lives and operations of the young American aircrew posted in the UK. 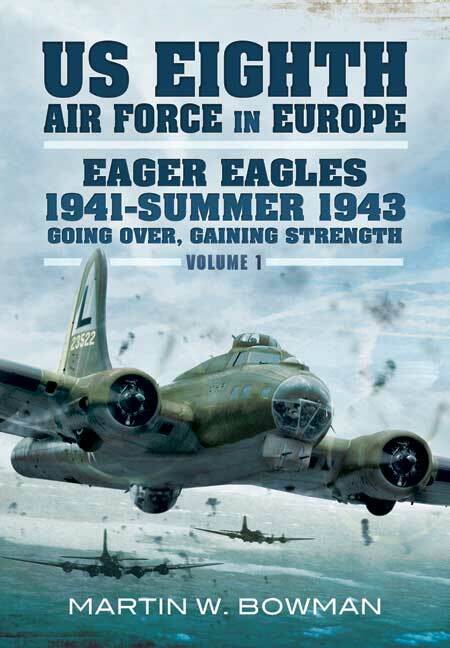 This first volume deals with the early months of the Eighth's campaign and provides insightful background into the world that was left behind when men enlisted for the USAAF service. Two sections of black and white images, refreshingly well captioned and managing to avoid repeating the more well-known Eighth Air Force photographs, add greatly to the book, while readers will also appreciate its comprehensive index. The first volume deals with the early months of the Eighth's campaign and provides insightful background into the world that was left behind when men enlisted for USAAF service. Two sections of black and white images, refreshingly well captioned and managing to avoid repeating the more well-known Eighth Air Force photographs, add greatly to the book, while readers will also appreciate its comprehensive index. Narrative accounts and new insights to catalogue the dramatic and first hand oral testimonies of the US Army Air Corps' bomber crews of the newly created Eighth Air Force that became stationed in East Anglia. Martin Bowman offers the same kind of coverage of the USAAF bombing campaign in Europe. The book runs to 204 pages with 32 pages of clear illustrations, dealing with the earliest American raids and continuing through the increasingly bitter air to air combats over Europe with bombers literally hundreds of aircraft taking part on both sides. There is clear evidence of thorough literally hundreds of aircraft taking part on both sides. There is clear evidence of thorough research on virtually every page livened by personal accounts by the airmen who took part. This is the first volume of a series, though it isn’t clear how many others are to follow. …a worthy companion to Bowman’s series on Bomber Command: recommended. Using narrative accounts and new insights this book catalogues the dramatic and first-hand oral testimonials of the US Army Air Corps’ bomber crews of the newly created Eighth Air Force that became stationed in East Anglia in 1942. Using narrative accounts and providing new insights, Bowman tells the story of America’s first encounters with the Luftwaffe, heavy Nazi air defences, and the wartime structures that Britain’s had already endured for three years.